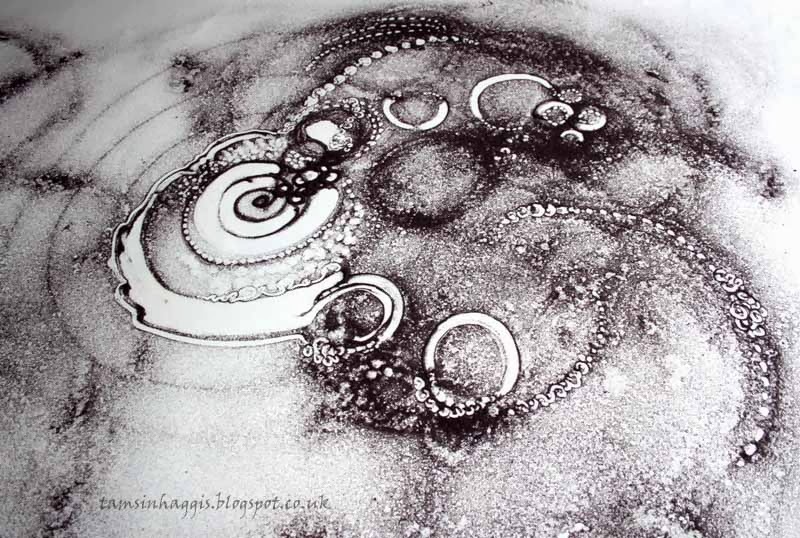 Sandpainting is an evolution from my studies of Indian Art and my work with complexity and dynamic systems theories. Dynamic systems theories (closely related to chaos theories) seemed to me to provide a science-based, theoretical articulation of many of the insights and principles that fascinate me in Indian philosophies and Indian theories of aesthetics. From Indian philosophy: cyclical time, constant movement and change (impermanence), the natural realities of endless creation and dissolution, the world as fundamentally interconnected on all levels, the world-creating possibilities of sound and vibration (particularly the human voice), the changeable and problematic nature of the human mind. From dynamic systems theories: the reality of constant change and evolution (repetition and novelty), the interconnectedness and unpredictability of living systems, the mystery of emergence and sudden collapse (feedback, resonance and amplification), the world as an interconnected web of multiple ecologies. From Indian aesthetics: art as a contemplative act, aesthetic perfection as a means of stilling and focusing the mind, stillness as a means of perceiving interconnectedness with all of life. In a world dominated by the goal of technological and medical progress, obsession with the culture of celebrity, myriad forms of displacement activity, and increasing personal alienation, it seems to me that many people are longing for a deep, resonating, visceral reconnection with themselves as interconnected elements of the natural world. This is the intention of sandpainting as performance. what's it all about, where is it going? A statement I prepared for Open Studios, at Marcelle House, Alloa, in June, 2014. I studied art at the Berkshire College of Art, Reading, and St Martin's School of Art, London. I then trained as an English Language Teacher and spent 10 years working in Italy, India, Japan and Australia, whilst trying to keep my painting alive. In 1991 I did a BA in Indian Art and Philosophy, and in 1996 a Masters in Adult Education. I was an Education lecturer and researcher in the university sector for fourteen years, publishing widely at postdoctoral level. Music and art have been with me since I was very young. After my early experiences of art school brought me more or less to a creative standstill, I had a sporadic relationship with both until 2004, when I began once again to try to learn to improvise on the violin. In 2009 I started painting again, and in 2012 I started singing. I’ve been a full time artist since 2010, working regularly with Kath Burlinson and Paul Oertel on their Authentic Artist and Discipline of Freedom workshops. The astonishing work of these two teachers has finally allowed me to bring art, music, dance, writing and song together. The paintings which began to appear in 2009 surprised nobody more than me. My art-starved soul finally found a way to circumvent my habitual attitudes and habits of thought and began to produce various types of process-based work which I did not consciously direct. After some time, I began to see that the shapes and fractal patterns that were emerging were a visual exploration of ideas that I had been exploring for over twenty years in a variety of professional contexts. I tried to follow my fractal-based process with as little interference as possible, observing it, and writing about it on Exploring Creativity, the blog I have been writing since 2009. In September 2013 I had my first solo exhibition, Wild Life, as part of the Stirling Fringe Festival, which included a performance poet and live sand painting. While I've been exploring undirected fractal colours (literally and materially, in the form of watery paint...) I've been wondering how my work is going to connect to my Indian studies. I did my thesis on the embodiment of god in sacred images, and at first I thought that the gods were going to make an appearance. But everything that has appeared so far has been connected to dance and music. I've been back to India twice in the last two years, and on my most recent trip made an in-depth study of Hoysala temple carvings at three sites in Southern Karnataka. Wild Life is a celebration of life across all levels of scale. It's a celebration of the creative processes that occur in the self-organising forms of slime moulds and beehives, of shell shapes and eco-systems, of cloud banks and human minds... of the patterns of cracked earth and frosted windows, of stomach viruses and cellular formations, and the colours of rock, sea and eroded stone. How to suggest the idea that humans are but tiny specks in a vast universe? To challenge the Biblical idea of humans being superior to, and having dominion over, nature (the idea that nature is 'there' for humans to use and exploit). How to express the idea that as humans we are not distinct from plants, or trees, or animals, or viruses? To challenge more recent ideas about the human connection to nature. I'd like to somehow give visual expression to the idea that the human/nature relationship goes far beyond the idea of connection - that humans are nature. The clouds, the frozen ice, your toe, the milk in the glass, your feeling of hurt, the grass beneath your feet; that it's all the same stuff. How to suggest the free, joyous potential of being a speck of human consciousness in a connected universe? How to suggest the coexistence of the dark with the light, of death with regeneration, of cycles rather than progressive trajectories? Might it be possible to allude to what happens when none of this is considered; when as human beings we live feeling distinct and separate? In 2014 I'm trying to focus entirely on this next phase of my work and don't intend to be participating in any public forums or exhibitions. But if you're interested in what I'm doing I always love to see people, so please get in touch at tamsin.haggis@gmail.com.